One of the challenges we may face when teaching high ability learners is that sometimes we underestimate how quickly they may complete and master a lesson. In these situations, many teachers have an alternative bag of tricks to keep students engaged. However, these activities can require unnecessary planning, transition time, and may even reinforce a student’s perception that school lessons are “too easy” and not intended for him/her. Before moving on to other things, teachers should consider whether simply nudging the lesson up a notch might better serve students’ needs. Assignment: Put each of your spelling words in a sentence. Challenge: Choose five of your spelling words and write each word in a sentence. Every word in your sentence must begin with the same letter as your spelling word. Your sentence must make sense. Assignment: Use a Venn Diagram to compare and contrast two subjects in your reading. Challenge: Explain why this comparison is interesting or important. Assignment: Identify the character traits of the main character, using evidence from the text to support your answer. Challenge: Your character is moving and packing a suitcase. If your character could only pack three things, what would they be? Draw/describe these items and explain why each would be chosen. Use evidence from the text. Assignment: Identify the main idea and key supporting details. Challenge: Write an 8-line poem that expresses emotions or feelings about the main idea. Assignment: Add/subtract all of the multi-digit numbers. Check your work using inverse operations. Challenge: Choose one or two problems. Arrange the digits to create a new problem with the largest/smallest possible sum/difference. Solve that problem. Explain how you know that you have found the largest sum/difference. Assignment: Solve the word problem. Challenge: Look at the word problem that you just solved. Create a new problem that (1) requires the solver to solve two more math problems in order to find the answer; or (2) contains different numbers, but has the same answer. Assignment: Find the Area/Perimeter of all of the shapes on the worksheet. Assignment: Solve the problems that use fractions. Challenge: Create a lesson that teaches a student how to solve one of the fraction problems in this assignment. Make sure that you explain why the student should do each step. Now “flip” roles—become the teacher and teach your lesson to a group of students. Assignment: Round the numbers to the nearest _____. Challenge: Choose three of the problems you solved. When would you need to round numbers like this in your everyday life? For three of the problems, create an example from real life when rounding the numbers in the problem may make things astoundingly easier! Acquiring new vocabulary should feel like donning a new outfit and gliding down the runway. We should take words home, cut off the scratchy tags, and add them to ourselves. Yet in the classroom, vocabulary study is sometimes more akin to taking inventory — leaving behind a pile of charts, lists, and workbooks. 1). Vocabulary Skits: Students create and perform 2-3 minute skits that use and show the meaning of a vocabulary word. 2). Creative Writing: Students choose 6-10 interesting words from a text they read and use them to create an original poem, song, or comic strip. 3). Vocabulary Rainbow: Students discuss how colors can be associated with different emotions. (For example, they may associate “yellow” with joy or “green” with peace.) Then, students collect several descriptive words from a text and group the words according to what “color” they bring to mind. Create a rainbow depicting words in “color.” Make a key for the rainbow that explains what mood/emotion each color represents. 6). In Other Words: Rewrite a partner’s problem-solving strategy using “math words” (domain-specific language). 7). Heard in the Classroom: When students are discussing problems in small groups, challenge a few students to be detectives and listen/note the context in which math vocabulary is used. Student “detectives” can share their findings on a “Heard in the Classroom” poster. 8). Be the Teacher: Challenge students to teach a math word. Students can create games and word problems to teach/model the assigned word. 9). Create A Problem: The teacher gives students a list of 4-6 math vocabulary words. Students create a word problem and present the solution. The steps for the solution must use all of the math words on the list. 10). Build Something: Build a model/create a design that applies or represents 10 math vocabulary words. Create a key with the list of words and how they are used to accompany the project. Gunn, Tim, and Kate Moloney. A Guide to Quality, Taste & Style. New York: Abrams Image, 2007. Print. As we begin the year, how often do we educators see things through the eyes of the diverse, gifted learners in our classrooms? Perhaps the best way to start is by putting ourselves in their chairs. As summer days come to an end, a useful ritual is to check out the view from each student’s perspective by sitting in each of their places. How easily can each student see the projector screen? A talkative friend? A view of the playground? Considering what students “see” can help teachers eliminate distractions and physical obstructions to learning; it can also help us find new ways to motivate high potential, gifted learners. (1). Role Models and Vision: Can I see a picture of an inspiring adult role model who shares my gender, culture, and/or race—a depiction that celebrates his or her contributions and achievements? What does that picture communicate to me about my future possibilities and potential? (2). High Level Questions: Is there a provocative, deep question that captures my attention and curiosity? Is there a question that I find fascinating to discuss with my friends at school and my family at home? How could the themes or topics we explore in the classroom this year be important or relevant to my life? (3). Rich Vocabulary: Is there a new, rich vocabulary word presented that would be fun to learn and use? How might it relate to math, science, or the world around me? (4). Personal Interests: Is there any place in this classroom for my own “learning agenda?” Does this classroom have a place for me to explore and share what I love to learn? Do I see something that shows me that the teacher or any other students might want to hear and talk about my interests and passions? If answers to the above questions are difficult to spot, some simple changes to the classroom landscape could positively impact instruction to meet the needs of gifted students. And once we consider the view from the students’ seats, our classrooms may provide a better vantage point to “see” more gifted students than we ever expected. For question examples, see “Essential Questions.” Essential Questions. Authentic Education, 2013. Web. 24 July 2016. <http://essentialquestions.org/random_questions.lasso&gt;. During my first year of teaching, I did not have a classroom space of my own. Instead, as many teachers do, I put my materials in a bag that I carried from room to room. Although “covering the bases” in this way presented challenges, the experience provided some of the best teacher “spring training” ever. What approach works best when helping learners to overcome academic challenges? As educators, it can be helpful to reflect on our own learning struggles. In fact, hiking in the Grand Canyon over this Spring Break, I experienced a memorable learning challenge at the edge of a magnificent precipice. Though I wanted to continue down the path at the start of the Grandview Trail, I was uncertain about how to approach it, and my knees were shaking with apprehension. Before barely descending, I returned to the top, defeated. But a little later, with the help of our guide, I tried again and made it far enough to enjoy some incredible views of the canyon. Students are most likely to persist if the goal is personally relevant and meaningful to them. The reason I overcame the challenge is because I really wanted to explore the canyon. Students must recognize that “trying again” is part of the learning process. When I first climbed back out of the canyon, I would have been finished with this trail had I not understood that “trying again” was a ready option. Students must feel comfortable asking for help. As I hiker, I was thankful to have a knowledgeable, friendly guide who kindly helped me on this trail. Sometimes a student’s difficulty may be based more upon self perceptions of ability, rather than actual ability. Teachers need to express their confidence in their student’s ability to meet challenges. Hearing that others were confident in my ability helped me immensely on this trail. Sometimes students need the opportunity to work through challenges slowly. Accomplishing my goal at a speed that was manageable for me brought success. I’m glad I wasn’t being timed on this one. Laughter is key. When hiking in new terrain, a laugh and a little humor helped to make learning fun and to keep difficulties in perspective. Laughter in the face of challenge is empowering. “Instant Grits.” I smile to myself when I see them on the store shelf, because as a Chicagoan, I always associate grits with vacation ease in a warmer climate. Grits are supposed to take time—you sit down and savor them with honey and biscuits. In the education arena, psychologist Angela Duckworth asserts “Grit is passion and perseverance for very long-term goals. Grit is having stamina. Grit is sticking with your future, day in, day out, not just for the week, not just for the month but for years, and working really hard to make that future a reality. Grit is living life like it’s a marathon, not a sprint” According to Duckworth’s research, “grit” is an essential ingredient for success—even beyond I.Q. For some, grit seems to be about prolonged attention span and perseverance even when activities are not immediately rewarding. This idea of “grit” sounds akin to pitting cherries, shelling peas, or husking bushels of corn. The world is full of mundane tasks for “teaching” grit in this way. Yet, in the classroom, it does seem more palatable to teach students to develop grit by striving and persevering for their own goals, rather than chasing unfulfilling ones. In light of this, some educators suggest that “grit” can be naturally fostered by having children identify their own passions or engage in project based learning. I do believe that passion projects bring joy to learning, and even students who otherwise lack “grit” may choose to stick with projects that are authentic and meaningful to them. But passion projects are unlikely to guarantee instant grit. Deciding what one’s passion is in the first place requires a respectable bit of perseverance for some students. Moreover, on the road to pursue passions, some students “fall out of love” with their projects when challenges arise. Perhaps in order to prepare students to achieve excellence in any subject, we need to make “developing grit” a more intentional part of our daily routine. One suggestion I have heard during discussions about teaching “grit” is the idea that “children need to fail.” Rather than being coddled and protected from failure, children need to learn to scrape themselves off the ground and try again. Although I will never know the complete recipe for “grit,” from what I have tasted, I find that the essential ingredient is not found in failure, but in student success. Teaching grit means helping students to see the connection between individual effort and excellence, and this can apply to any subject. As teachers, the challenge is to teach “grit” everyday. Celebrating effort and realizing the results – even incremental results – again and again is what motivates students to develop the habit of striving. Given this reality, the secret ingredient for teaching and learning “grit” may be time. …time to develop and create thoughtful work products. …time to revise work to achieve excellence. “The Key to Success? Grit.” Angela Lee Duckworth:. TED Talks, April 2013 Web. 24 Feb. 2016. <https://www.ted.com/talks/angela_lee_duckworth_the_key_to_success_grit?language=en&gt;. We discussed these lists and what we could do as a class to keep our discussions positive. Treat each other respectfully, give all students a chance to speak, and refrain from side conversations are examples of the norms that we established. As I reflected upon this lesson, I realized that approaching discussion with a child-like honesty and a quest for the truth was not “starting small” in any sense. Even at a young age, these children had already noticed, experienced, and/or internalized sometimes subtle inhibitors to meaningful discussions—facial expressions and judgment of others—that can silence meaningful dialogue. They understood that people may hesitate to discuss sensitive or difficult topics for fear of what others might think. Yet, these sixth graders also embraced the idea that positive discussions are those that can potentially lead us to change our minds. Classroom discussions belong to the students, and we continue to reflect on their quality and impact throughout the year. Also, we refer back to this list as our discussions continue, deepen, or sometimes wander off course. Reflecting on personal experiences and understanding my students’ perspectives was essential groundwork for productive classroom discussion and continues to be well worth the class time. Brookfield, S.D. & Preskill, S. (2005). Discussion as a way of teaching: tools and techniques for democratic classrooms. 2nd Ed. San Francisco, CA Jossey-Bass. For us teachers, “New Year’s Day” offers a second chance to look ahead at all of the possibilities and make new resolutions. In addition to the luxury of celebrating the new year with a fresh start to the school year in August, we observe the January 1st New Year along with the rest of the country. Teachers are experts at ringing in the New Year, and have twice as many opportunities to be creative with New Year’s resolutions. As part of my personal “second New Year’s celebration,” I resolve to enjoy more meals with friends and family at home by pulling out a few of the “tried and true” recipes. By cooking up lasagna, bisque, or a pie, I need not worry about the basic recipes, but can add a special twist or two to the old favorites and focus on listening to and enjoying the guests. Teachers have an endless smorgasbord of “new dishes” out there to digest and absorb into the classrooms—new Common Core standards, new changes in curriculum, new instruction, new technology. Of course effective teachers need to continually sample and master new curricula, keep up with the latest technology, and learn new instructional strategies. However, to maintain excellence, teachers also need to fully digest, taste, savor, and add new spice to the instruction being served. We need to nourish our students with some “tried and true” menu items that improve over the years with reflection, experimentation, and modification. So what can we do to provide a balanced menu in the classroom? Very simply—let’s find some truly great recipes for learning and prepare them more than once. To welcome 2015, here’s a simple New Year’s Resolution for the classroom– “Do something old.” Choose a lesson or a unit that was taught before, and find a way to improve it by approaching it from a different angle, presenting it in a more engaging way through technology, enriching it with questions to promote high level thinking, focusing on an applicable state standard, or adapting instruction to meet the unique needs of a student. Have fun. Be fulfilled. Let’s resolve to teach something old, but not just again—Let’s teach it better. 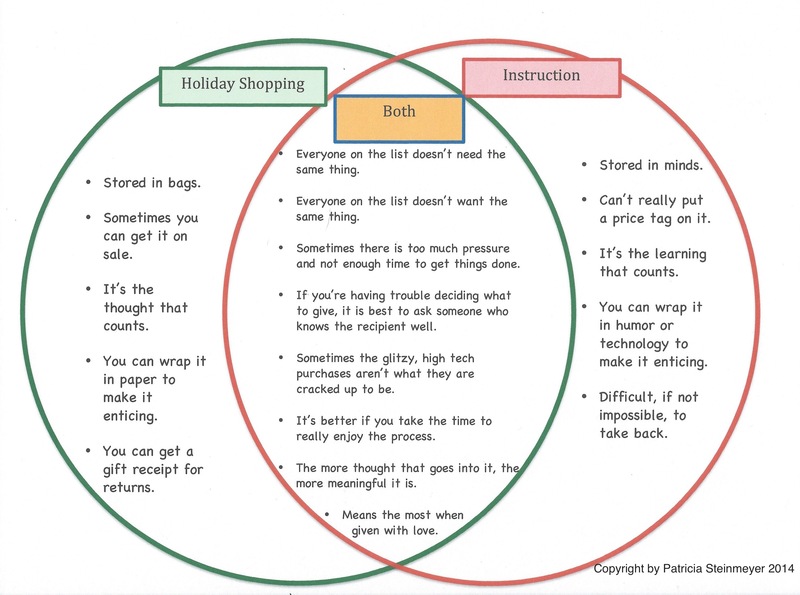 Instruction vs. Holiday Shopping: What’s the “Wrap”? ¹Marzano, R. J., Brown, J. L., & Association for Supervision and Curriculum, D. (2009). A Handbook for the Art and Science of Teaching. Alexandria, VA: Association for Supervision and Curriculum Development. With the new Common Core, teachers are unpacking standards, adjusting instruction, incorporating technology, and sifting through new piles of educational stuff. But whether these resources are “gifts” or “distractions” depends upon whether teachers use them to spark or inhibit meaningful conversations. In essence, teaching means understanding and responding to the needs of learners in our classrooms. We do this when we talk with the students. …And they could squeak and squawk and speak and talk to me! As human beings, teachers and students certainly do not need magic to communicate. But, as Dr. Dolittle found, talking can bring about amazing discovery. Student Response: “I pictured myself taking my unit cube [a plastic one-by-one centimeter block] and counting how many cubes would fit on the line segment. I had assumed that these were careless errors! Yet, by asking and listening to the students, I discovered the “little cube in their minds” that they were using to measure length. So, rather than tell them to slow down and check their work, I gave them what they truly needed–more “hands-on” practice with appropriate measuring tools and with using units to show what they measured — length, volume, or area. Although the results can seem magical, unlike in Dr. Dolittle, there is no “fairy tale” process required for talking with students. 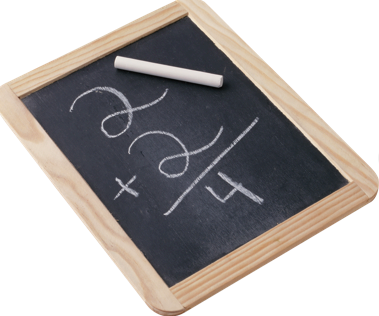 It is simple, natural, and essential for learning. Data, technology, and assessments can’t get us there. Let’s accept the truth: To truly improve education, we need to recognize, nurture, and enrich the conversation inside our classrooms. We need to talk with the students. And we need to listen. Although there is some debate about the value of homework in elementary school, thoughtfully designed homework can support learning for our younger students. 1. How does this assignment support student learning? 2. Are teachers, students and parents aware of the approximate time it should take for the student to finish this assignment, and is this time period appropriate for the grade level? 3. Are the directions clear? 4. Is there homework that other teachers are assigning? 5. Do the students have a workable plan for what they should do if they struggle with the homework or have questions? 6. Can all of the students be reasonably expected to have the support and tools available at home to complete the homework successfully? 7. Is the assignment meaningful and engaging for students? 8. Do the students have a system to record assignments, and a clear procedure for correcting assignments/turning them in to the teacher for feedback, and do any students need extra support with this system? 9. Are there major extracurricular events are happening in the school or surrounding community that may impact homework time/student motivation? 10. When assigning homework and determining class procedures for student accountability, have the daily realities and challenges of family life been considered?